Candy corn season doesn’t last very long, so you should take full advantage of it with this deliciously creamy Candy Corn Ice Cream! It’s the perfect Halloween treat. 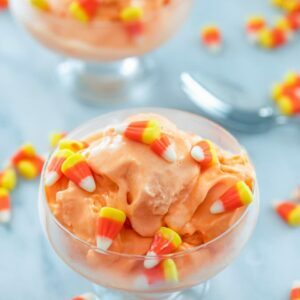 (This recipe for Candy Corn Ice Cream was originally posted in October 2010, but was updated with new photos in 2018). I often wonder how many candy corn casualties occur each year. I have this theory that everyone begins life with a love for candy corn. But then comes one ill-fated day when they consume just one too many candy corn. Or more likely, one too many handfuls of candy corn. And then they’re turned off candy corn forever. Tragic. Lucky for me, I have an extraordinarily high candy corn tolerance. Sure, there are times I might hate it for an evening. But for the rest of life? Pshh, I don’t see that happening any time soon. And since candy corn is only in our lives for such a fleeting amount of time each year, I recommend enjoying it to its fullest potential. That means in any form you can possibly think of. Including (but certainly not limited to) martinis, granola bars, etc. And ice cream. You most definitely need candy corn ice cream in your life. The ingredients are totally simple. Heavy Cream. Whole Milk. Candy Corn. I mean, does life get any better than this? 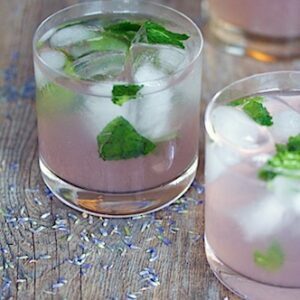 How often do you make a totally amazing recipe with just 3 ingredients? Ingredients you may just have sitting in your kitchen as we speak. If you happen to be like me and always have candy corn on hand. This candy corn ice cream also doesn’t involve any eggs, so no need to make a custard. You do need to heat half of the milk in a saucepan with some of the candy corn. The candy corn will dissolve into the hot cream and turn it into a vibrant orange color. The only downside to this recipe is that it requires some waiting, like most ice cream recipes do. After you heat the cream and candy corn, you need to chill everything for about 6 hours. Then you’ll process the ice cream in an ice cream maker and chill it again for at least 6 more hours (As the ice cream is processing, I add in another cup of chopped candy corn because why not?). Zzzzz. But trust me, it’s totally worth it. If you happen to be in the market for an ice cream maker, I can’t recommend the KitchenAid ice cream attachment (affiliate link) enough. Of course, you need to have a KitchenAid mixer to use it, but if you do, it’s the easiest thing ever. Anyway, I just think the color of this ice cream is so glorious. It’s basically the prettiest shade of orange you could ask for. 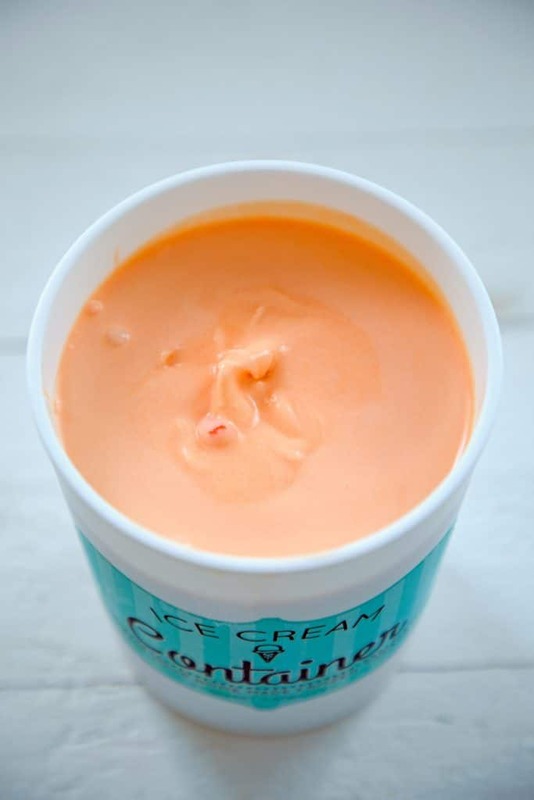 It almost looks like creamsicle, but it’s even better because it’s candy corn! I obviously served the candy corn ice cream with even MORE candy corn. I know, I’m tempting the candy corn Gods now. But I love living on the edge. I’m honestly surprised more ice cream brands aren’t selling candy corn ice cream in stores at this time of year. Is it because candy corn is just too controversial with the general public? Even without all the extra candy corn, this ice cream tasted exactly like everyone’s favorite Halloween treat. But creamier, of course. You could blindfold anyone, feed them a spoonful of this, and I guarantee they’d know right away that they were eating candy corn ice cream. I love how smooth and melty it is; one of the creamiest ice creams I’ve made! Also, have I mentioned how much better candy corn is when it’s slightly frozen? Yes, it does get better! Come on, I mean candy corn season doesn’t last all that long, so you owe it to yourself to make the most out of it. Candy corn ice cream topped with and surrounded by candy corn is the perfect way to do so. Just please, try not to overdo it. You’re an adult; you can be responsible. Right?? Right??? Next up: I think I need to put this ice cream in a blender with another big bag of candy corn and create a milkshake out of it. What? 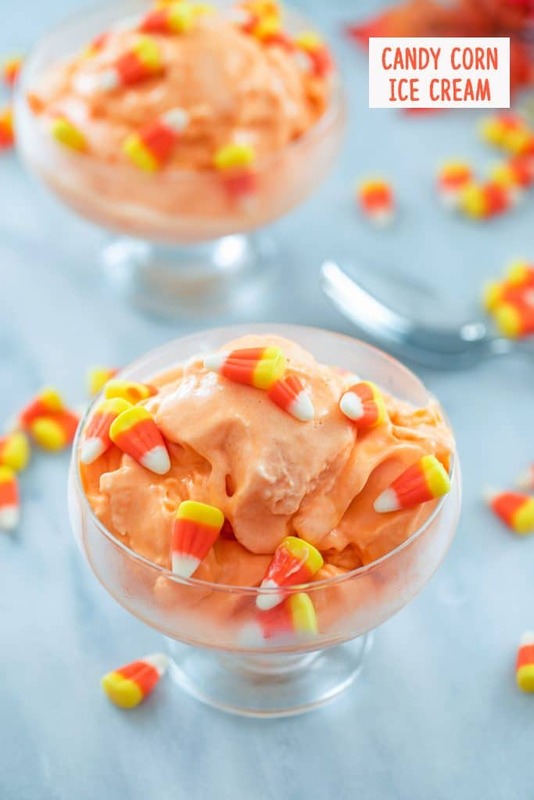 Now, go and make this candy corn ice cream! Before we get too far into the Halloween season and you overdo it and can’t stand the sight of candy corn for another 11 months (at which point you’ll do it all over again!). Guys, please candy corn responsibly. Are you a candy corn lover or hater? Candy corn season doesn't last very long, so you should take full advantage of it with this deliciously creamy Candy Corn Ice Cream! It's the perfect Halloween treat. Add 1 1/2 cups heavy cream and 1 1/2 cups candy corn to a medium saucepan over medium heat. Let mixture heat (without boiling) and stir until candy corn is dissolved. Move mixture to a large bowl and let cool to room temperature. 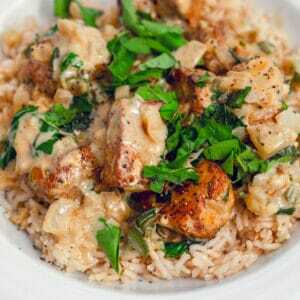 Stir in remaining heavy cream and whole milk. Cover bowl and place in fridge to chill for at least 6 hours. Once chilled, pour mixture into ice cream machine and process according to manufacturer's instructions. While ice cream is processing, chop another cup of candy corn. Once ice cream is almost done processing, add in chopped candy corn. Place ice cream in airtight container and place in freezer for at least 6 hours, but ideally overnight. 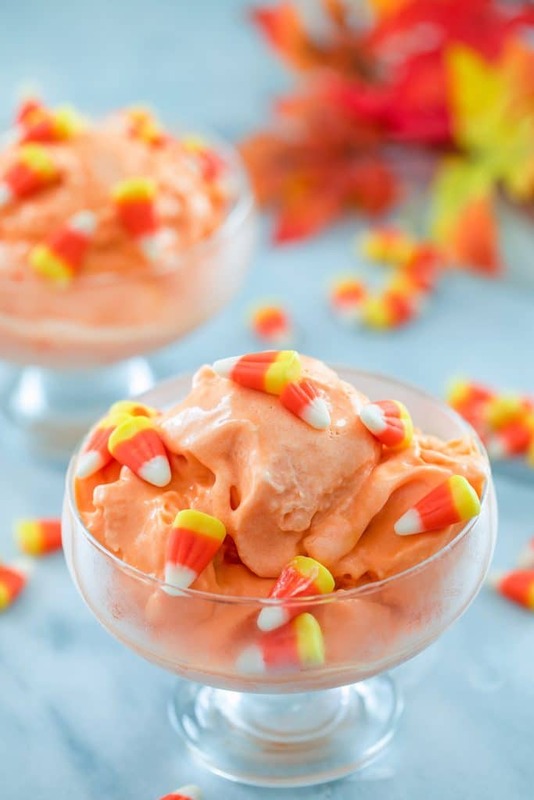 Serve ice cream in bowls with remaining 1/2 cup candy corn sprinkled over the top. ≤ftarrow; Project Food Blog #5: Thanksgiving Pizza… Pie! 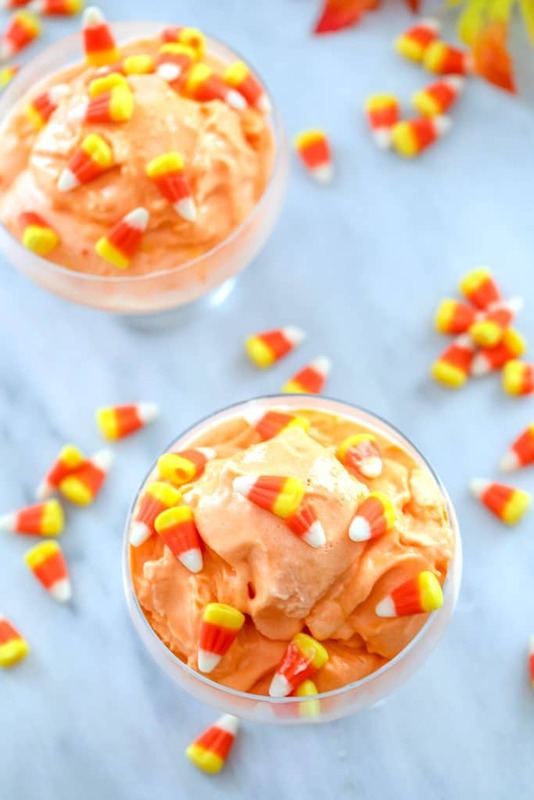 51 Responses to "Candy Corn Ice Cream"
@Karen Yes!!! That’s what I have and it’s awesome. I keep the bowl in my freezer all the time, so it doesn’t take any counter/shelf space and it’s always cold enough/ready to go. As long as you have enough room in your freezer, it’s absolutely perfect! I love I love I love! And yes please make a milkshake out of this. Drinkable candy corn sounds dangerous but oh so delicious. This is just fabulous. A big thanks from a candy corn freak like me. i used to eat candy corn by the BAGFULS and kinda od’d. but this might bring me back! Oh my gosh!!! You guys are just amazing. beautiful! i don’t love candy corn, but i bet i would love this ice cream! omg… this really is incredible. What a clever idea! YUM – that is amazing. My fiancee and I love candy corn to the point where we can only buy the small bags, and then have to put it out of eye sight so we don’t pour it buy the bucket full down our throats. We’ve OD’d one too many times. But… I may need to try this this weekend! I’ve been wanting an ice cream maker for some time now… I know think I can say I “need” one. YUM YUM YUM! Glad you liked it. The next time I make it I will add candy corn pieces. I just wanted to see how much flavor I would get without the extra pieces. MMMMM. Trying this IMMEDIATELY. How have I not thought of this before?! I have a serious candy corn obsession. Good job ladies! The candy corn gods are definitely smiling. Even making me think again about imbibing those sweet autumn treats again. And your Thanksgiving pizza remains inspiring – voted and good luck! You have totally outdone yourself. And I am now in the market for an ice cream maker. Hey! I love your blog, but I just need to add a little opposition to your theory 🙂 I’ve always hated candy corn. However that might also stem from growing up in Germany and without many sweets! 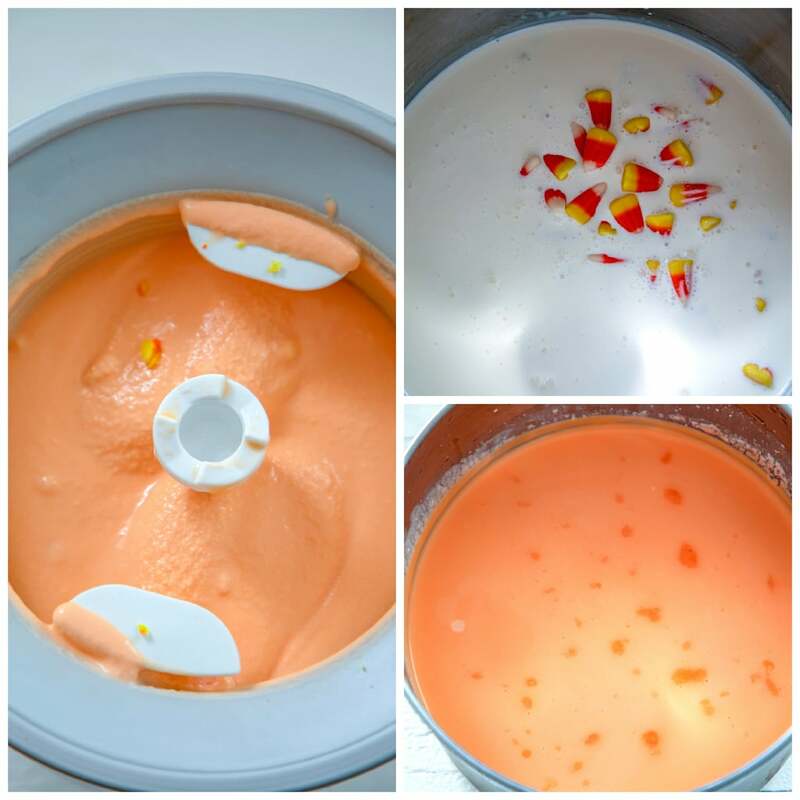 Candy corn ice cream – what a crazy idea! But a delicious one. Candy corn ice cream!? I think I just died and went to candy corn heaven.. I’m one of those people that can’t wait for Fall solely because of the candy corn abundance.. I have one pack at home and one at the office at the moment 🙂 Just so I’m always near it! Clever idea, but candy corn? Just the thought of it makes me want to go brush my teeth. WOW, that idea had never crossed my mind, but I’m sure glad it entered yours! That is one dessert I’d never forget! i love candy corn. even though i’ve eaten so much of it at points in my life, i’ve felt sick. i can always go back. and will always go back. and yummmmmmm. I don’t have an ice cream maker so I think Ben & Jerry’s or Edy’s needs to market this ASAP! I have a pretty high candy corn tolerance also. I totally OD on it on Halloween but then I’m perfectly fine for next year. 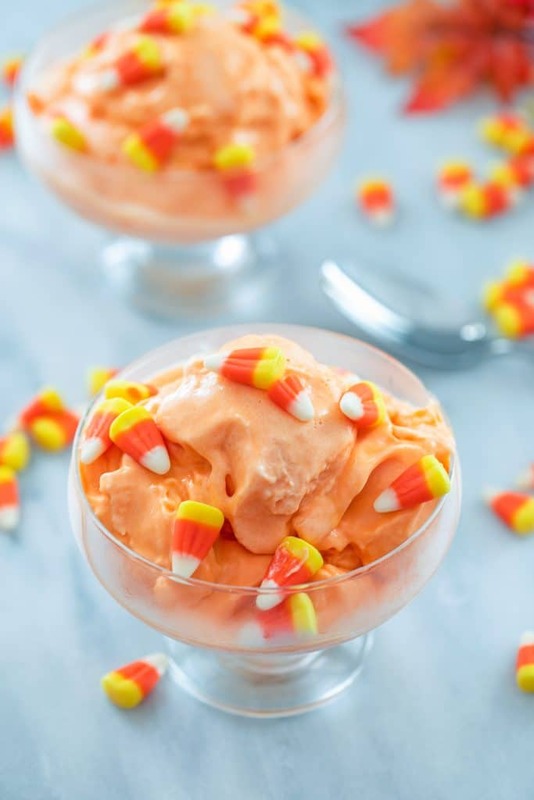 Love this candy corn ice cream! I saw it on Peabody’s site and fell in LOVE. And now you just made me fall in love even more. I’ve somehow never heard of this, but I love it! I live in Phoenix, where it’s warm year round, and am always thinking ice cream sounds perfect regardless of the season/holiday. 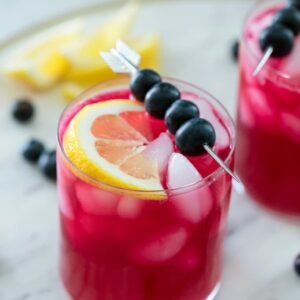 Thanks for the cool idea and recipe! ha, I wish I could hand this out instead of candy on halloween! have u seen the candy corn recipes on food52.com? this is amazing, i posted that your recipe for Candy Corn Ice Cream is up in the comment section for Candy Corn: Henge (a stone henge sculpture made of candy corn). Candy Corn Mousse and Chocolate Covered Candy Corn also on the food52 site. Other fabulous Halloween treats, including a delicious fall cocktail with Maker’s Mark, Apple Cider, and Maple Syrup. Cheers!! Whoa. I gained 7 pounds just reading this post. I am not a candy corn fan at all but I think my boyfriend might finally propose if I served him this. Wow, what a great idea…love the color of the ice cream…must taste SO yummie! I have to admit I’m not a huge candy corn fan, but your post is making me wish I had an ice cream maker and some candy corn! Oh, yum! I have a very, very, very high tolerance (okay, obsession) with candy corn, and can’t wait to try this! I just gained five pounds from looking at these photos alone. This isn’t even funny how good this looks. An ice cream maker is definitely going on my Christmas list. I love this! I usually overdo it with candy corn and then can’t look at it for awhile, but this looks like the perfect way to enjoy it! haha, why is it always that we eat to much of these candy corn?? 🙂 great job!! 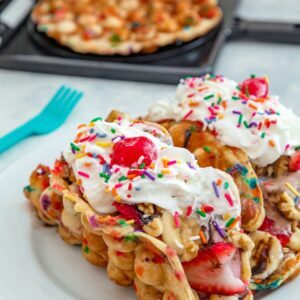 Such a fun fall dessert and an excuse to dig out my ice cream machine. Tastes amazing! It has a really great flavor, however my batch has a waxy feel to the tongue when you taste it. I’m not sure how to fix that? @Melanie- I wonder if it has something to do with the kind of candy corn you used? My friend and I were just having a serious convo about how the “fancier” candy corn always feels waxy and the cheap candy corn tastes so much better. I used super cheap store brand candy corn in my ice cream, so I’m thinking that could make a difference. @Sue, I bought Brachs candy corn from my local Walgreens. Since it turned out waxy, I’m attempting to make my own candy corn from scratch to see if that works better.